Trial Tests Organ Transplants For HIV-Positive Patients : Shots - Health News Hundreds of otherwise viable organs that are HIV-positive are wasted each year, while HIV-positive patients in need of transplants languish on waiting lists. Researchers want to change that. 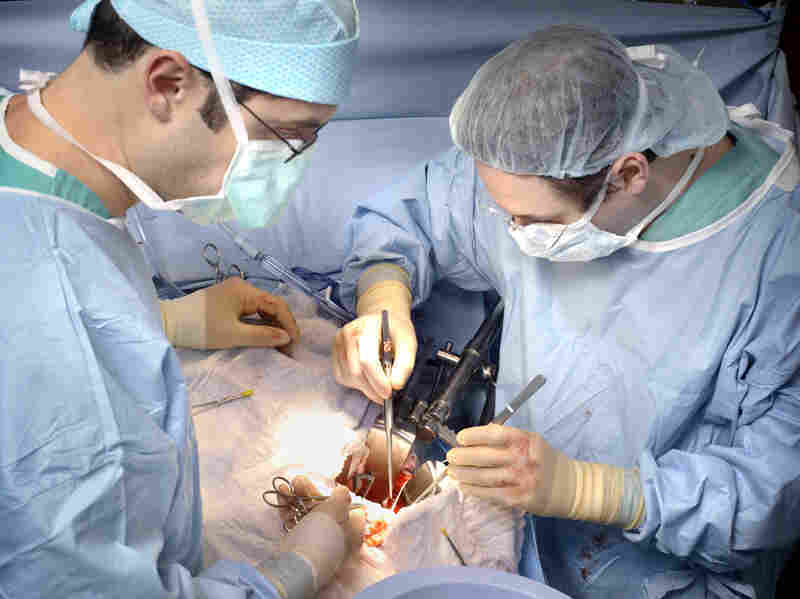 Surgeons at Johns Hopkins perform a transplant using an HIV-positive organ. A large-scale clinical trial launched by the National Institutes of Health in May could pave the way for more HIV-positive patients with kidney disease to receive life-saving transplants. The trial, called the HOPE in Action Multicenter Kidney Study, will assess the risks of transplanting kidneys from HIV-positive donors into patients living with the virus, says Dr. Christine Durand, assistant professor of medicine at Johns Hopkins University and a principal investigator of the study. "We have an organ shortage crisis in this country and individuals living with HIV are disproportionately affected," she says. The research will help determine whether the pool of HIV-infected organs is "safe and effective." If so, she says, it would benefit everyone awaiting kidneys. "Every time someone with HIV gets an organ transplant they move everybody else up on the waitlist," says Durand. There are 468,000 Americans receiving dialysis for end-stage renal disease. According to Durand's research, an estimated 1.5 percent of those live with HIV. About 1 percent of liver transplant candidates have HIV. "This means that more than 10,000 HIV positive individuals could benefit from a kidney or liver transplant," says Durand. The HOPE in Action study will track 160 kidney transplants, half receiving HIV-positive kidneys and half receiving virus-free organs. Recipients will be monitored after surgery for signs of organ rejection, organ failure, and other complications, such as the risk of infecting the patient with more than one strain of HIV. This will allow doctors to more accurately predict risk after these transplants, and offer the procedure to more HIV-positive people on the transplant waiting list. The researchers also hope to make a case for allowing such transplants to become standard care. Currently, HIV-positive transplants are only permitted if they are part of a clinical trial, such as this one. In 2013, President Obama signed a law, the HIV Organ Policy Equity (HOPE) Act, allowing HIV-positive individuals to donate certain organs (currently only kidneys and livers), but only as part of a research study conducted with oversight by an academic institution. That law partly rolled back a 1988 law which outlawed harvesting HIV-infected organs. "At the time it was at the height of the AIDS scare," Durand says. "HIV was a death sentence, so there were a lot of laws put into place to protect the blood supply, to protect organ donation." HIV-positive transplant candidates are already eligible to receive virus-free organs, but generally "they face longer wait times than those who don't have the virus," says Durand. This is the case, she adds, even though they have similar survival and organ function after transplant. As HIV testing and treatment improved, donation has become feasible, she says. And early research started to show transplant survival rates could be similar to those of transplant recipients without HIV. But "many transplant centers say they don't have the expertise or experience to perform these transplants," says Durand. The HOPE study may provide data to change this and set clinicians' fears to rest. One center participating in the trial is Indiana University Health in Indianapolis. They've yet to perform a transplant but in April, the Indiana Donor Network, Indiana's organ procurement organization recovered organs from an HIV-positive donor for the first time, and successfully matched a kidney and a liver to two people who needed them out of state. Dr. Tim Taber, chief medical officer for the Indiana Donor Network and a transplant nephrologist at Indiana University Health says he thinks the HOPE in Action study can change clinicians' attitudes about HIV-positive transplantation. "I think people will be more comfortable with it after a while and after they see that it's been successful so I think it will become more and more common to see HIV-positive donors procured and put in, obviously, HIV-positive recipients," he says. It took a few years after Obama signed the HOPE Act for transplants to actually happen between HIV-positive people. In 2015, the National Institutes of Health and Health and Human Services published safeguards and research criteria for medical centers willing to perform these transplants as clinical research. And a team at Johns Hopkins performed the first HIV-positive organ transplant in 2016. Any organ procurement organization that follows the NIH research criteria can send HIV-infected donor organs to transplant centers. So far only 16 out of 58 organ procurement organizations around the country have worked on HIV-positive cases since the HOPE Act made it legal, according to Brianna Doby, donation community consultant for a team at Johns Hopkins University that supports organ recovery organizations dealing with their first HIV-positive donor. So far, there have been approximately 50 HIV-positive kidney and liver transplants performed in the U.S. This is far fewer than researchers at Johns Hopkins predicted in a 2011 study, published in the American Journal of Transplantation. They estimated between 500 and 600 new HIV-positive organs would become available after the HOPE Act. Doby says for the past several decades the transplant system has focused on doing everything possible to exclude disease from the donor pool, including HIV and Hepatitis C. And some organ procurement organizations still fear their staff will be at risk when working with an HIV-positive donor. But that needs to change, she says. "We need to be able to work with organs that increase the risk of those disease, or if you have one of those diseases, find a donor that has those," she says. "Because it's the best shot you have at life, right?" For the HOPE Act to fulfill its potential Doby says more donors are needed. "The HOPE Act is not widely known about and many people might just assume they can't be donors if they are also HIV-positive, so they don't register," she says. Donation centers are gradually starting to recover more HIV-infected organs, according to Dorry Segev, a transplant surgeon at Johns Hopkins and another principal investigator on the new NIH study. Some local organ procurement centers are "interested in being pioneers in this area and have been really responsive and good at recovering organs from donors with HIV," Segev wrote in an e-mail, while others are "waiting in the wings to see what happens." Any fear they have about the safety of harvesting HIV-positive organs are unfounded he says. He hopes more centers will realize that "recovering HIV+ organs is not just something interesting, but is actually a responsibility to our patients." At hospital transplant centers, clinicians biggest fear is that patients could contract a second strain of HIV from the donor, Segev explains. "In fact," he wrote, "we have such good [antiretroviral therapy] regimens that basically any strain of HIV can be suppressed with some ART regimen, so no matter what strain of HIV comes from the donor, we can basically treat it in the recipient." If a hospital performing transplants wants to receive HIV-positive organs they have to receive institutional review board approval and prove that they can meet transplantation criteria outlined by the Department of Health and Human Services. The process might deter some transplant centers from participating. Indiana Donor Network's Taber says it's not hard to meet the requirements to procure HIV-positive organs because the safety precautions are the same whether or not there's an infection. His protocol is to "treat everybody like they have some infection from the moon that you don't want to get." And if it can help more patients get transplants, he says, it's a good thing. "It provides just another opportunity for patients to get transplanted," he says. "It's not a home run but it's one more way to get these people off the list." Durand says there's a lot of untapped potential to work with HIV-positive organs. So far 24 centers meet the criteria to perform transplants between people with HIV. Among these centers, Durand said there are more than 300 patients with HIV who have agreed to accept an HIV-positive organ. "We expect this number to grow significantly," she says. And if the trial goes well, it might open the door to other organs. She hopes future research trials will include hundreds of HIV-positive people waiting for hearts and lungs. This story was produced in collaboration with WFYI and Side Effects Public Media, a news collaborative covering public health.